C/2015 V2 (Johnson) was discovered on 3 November 2015 by Jess Johnson (Catalina Sky Survey), using a 0.68-meter Schmidt–Cassegrain telescope. At the time of discovery the comet had an apparent magnitude of 17.1. Its incoming orbit had a Semimajor Axis of 59,200 AU, but after crossing its perihelion the orbit will become hyperbolic with an eccentricity of 1.0009, thus C/2015 V2 will leave the Solar System. 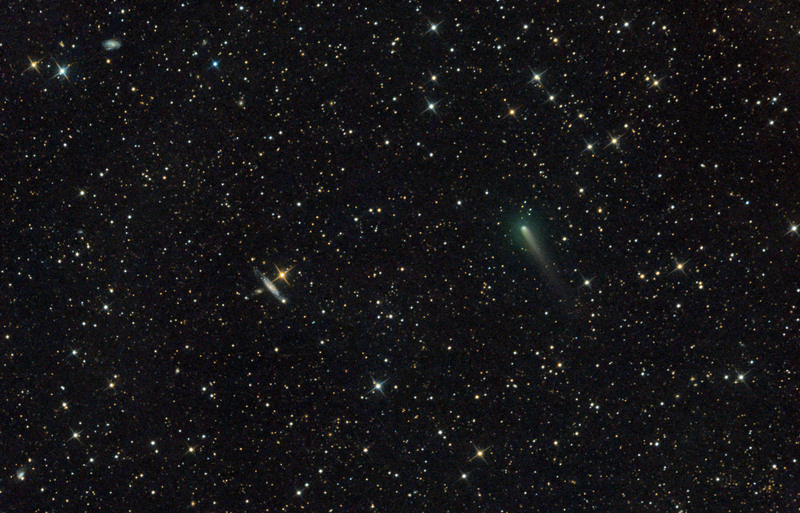 This image shows the comet on the night of December 12th 2016 at 1:00 a.m. UT, when it was near the spiral galaxy NGC 5297. Some other galaxies are visible at the background (see mouseover). Exp. Details: L: 8x2, R:8x2 min, G:8x2 min, B:8x2 min, Bin 2, Total Exposure Time - 64 min.